What’s All the Hookah About? The last time I was in the suburbs, I saw a smoke-filled place with a large sign that read, HOOKAH. The sign to the right of the entrance said, MUST BE 21 TO ENTER. Oh REALLY? Looks strange. Bunch of kids. What a racket, I think. When I get home I look it up. As suspected, it’s not healthy at all. It’s not like inhaling water. Time to educate kids and their parents, as these lounges are popping up everywhere. Kids spend about $12.00 to smoke and they sell alcohol in these lounges. Of course, the alcohol isn’t to be served to a minor, but then how is the whole place filled with kids? It’s amazing how NYC goes through so much trouble to ban cigarettes –yet these lung damaging dens are permitted. FACT: Recent studies have found that smoking from a hookah is just as dangerous as smoking a cigarette. Most of the people think hookah smoking as a safer alternative to other forms of smoking because the hookah smoke is filtered through water before it is inhaled. FACT: Hookah smoking involves more nicotine than cigarette smoking because of the massive volume of smoke, smokers inhale during hookah smoking. There is a strong belief that the water in the hookah filters out all the “bad stuff” in the tobacco smoke, but it’s completely a nuisance. FACT: A study done by the World Health Organization showed that one hookah session of a mere few hours can deliver as much smoke into your lungs as 100 cigarettes. Cigarette smoke is uncomfortably hot if a smoker inhales it deeply. Hookah smoke has been cooled by its passage through the water. The smoker has to inhale hard to pull the smoke through the hookah. By this the hookah smoke goes deep to the lungs. In to the duration of a typical hookah session, the smoke deposits in huge volumes into the lungs. What the Study say about Hookah Smoking ? Research indicate that hookah smoking can be even more harmful to health than cigarette smoking. Hookah smoke has a higher level of heavy metals and carbon monoxide than cigarette smoke, because of the charcoal which is burned on top of the tobacco mixture. A 45 minutes of hookah smoking is equivalent to smoking 50 tobacco cigarettes. It was found that smoking hookah for 45 minutes means consuming tar equivalent in 20 tobacco cigarettes. The amount of cellular chromosomal damage produced inside the mouth in hookah smoking is the same as that seen in cigarette smoking. What is the bottom line for hookah smokers who think it as a better substitute to cigarette smoking? Almost every method of making smoking safer is a mere nonsense. There is only one way to totally reduce the chances of fatal diseases caused by smoking, is to quit smoking completely. What Hookah Smoking Does To Your Health? What are the Dangers Of Sharing In Hookah Smoking? Hookah smokers can use their own mouthpiece while smoking the hookah communally. However, sometimes it so happens that they share the mouthpiece. FACT: Sharing of the single mouthpiece can spread diseases such as herpes, hepatitis, tuberculosis. Hookah smoking is not a harmless form of smoking. It can be as dangerous as cigarettes. The long-term consequence of hookah smoking would be increased dependency. Some youngsters, who innocently try hookah as a safe means of smoking, can get addicted. They can further switch to cigarettes as they can be carried around easily. All this proves that hookah smoking cannot be dismissed as safe alternative. Hence, it always helps to stay away from a hookah. Hookah smoking is not safer than cigarette smoking. Also known as narghile, shisha and goza, a hookah is a water pipe with a smoke chamber, a bowl, a pipe and a hose. Specially made tobacco is heated, and the smoke passes through water and is then drawn through a rubber hose to a mouthpiece. The tobacco is no less toxic in a hookah pipe, and the water in the hookah does not filter out the toxic ingredients in the tobacco smoke. Hookah smokers may actually inhale more tobacco smoke than cigarette smokers do because of the large volume of smoke they inhale in one smoking session, which can last as long as 60 minutes. Hookah smoke contains high levels of toxic compounds, including tar, carbon monoxide, heavy metals and cancer-causing chemicals (carcinogens). In fact, hookah smokers are exposed to more carbon monoxide and smoke than are cigarette smokers. As with cigarette smoking, hookah smoking is linked to lung and oral cancers, heart disease and other serious illnesses. Hookah smoking delivers about the same amount of nicotine as cigarette smoking does, possibly leading to tobacco dependence. Hookah smoke poses dangers associated with secondhand smoke. A harmful form of tobacco use, known as the hookah or water pipe, may be spreading among youth in the United States according to researchers from the University of California, San Diego’s Department of Family and Preventive Medicine and San Diego State University. 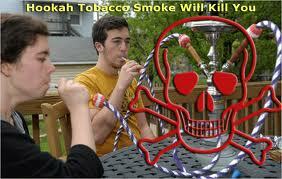 In April of 2011, they released a report that hookah use among teens in San Diego county rivals use of cigarettes. This trend is emerging even as cigarette smoking among high school students is on the decline nationally. The team of researchers examined patterns of use, risk perception, and psychosocial risk factors among users, former users, and nonusers of hookah at three San Diego high schools. The paper, “Determinants of Hookah Use among High School Students,” was published in the April edition of Nicotine and Tobacco Research. Wael Al-Delaimy, MD, PhD, associate professor and chief of the Division of Global Health in the Department of Family and Preventive Medicine at UCSD School of Medicine is the team’s senior author and a research expert in the field of tobacco control. More than a quarter of the surveyed students (26.1 percent) reported they have tried hookah, and 10.9percent smoked hookah in the past month, which is comparable to the percentage of high school students in this study population who smoked cigarettes in the past month (11 percent). Furthermore, close to one third of hookah users have no intention of quitting this habit. “Understanding the hookah habits of teens is important because a person’s tobacco use pattern – whether or not, and how often – is usually established by age 18,” said Al-Delaimy. Joshua Smith, PhD, from Al-Delaimy’s laboratory, surveyed 689 students from three high schools within San Diego County and found more than half of the students first learned about hookah from friends (50.3 percent) and another 20.9 percent learned about it when they saw a nearby hookah lounge. “The concern here is that the students surveyed believed hookah use to be more socially acceptable than cigarettes, and friends seem to be introducing this habit to others. They also believe it is less harmful than cigarettes, cigars, and smokeless tobacco, which has not been reported previously among high school students,” said Smith. Researchers recommend that the legality of hookah lounges in California and other states be addressed, adding that the banning of one product (cigarettes) with the legality of another (hookah) may suggest an element of reduced risk associated. “Policy makers and the tobacco research community should reassess priorities for this age group and address the growing hookah epidemic through continued research, media messaging, and restrictions on hookah lounges,” said Al-Delaimy. In addition to Al-Delaimy, the research team includes Joshua Smith, PhD, MPH, UCSD Department of Family and Preventive Medicine; Tomas E. Novotny, MD, MPH, San Diego State University; Steven D. Edland, PhD, UCSD Department of Family and Preventive Medicine; Richard Hostetter, PhD, San Diego State University; and Suzanne P. Lindsay, PhD, MSW, MPH, San Diego State University. The bottom line is stay away from Hookah. Thanks, Fitness Phoenix. There will be a radio broadcast this week on healthy eating you and your followers will definitely be interested in…I’ll post the link as soon as I have it. Hope all is going well.